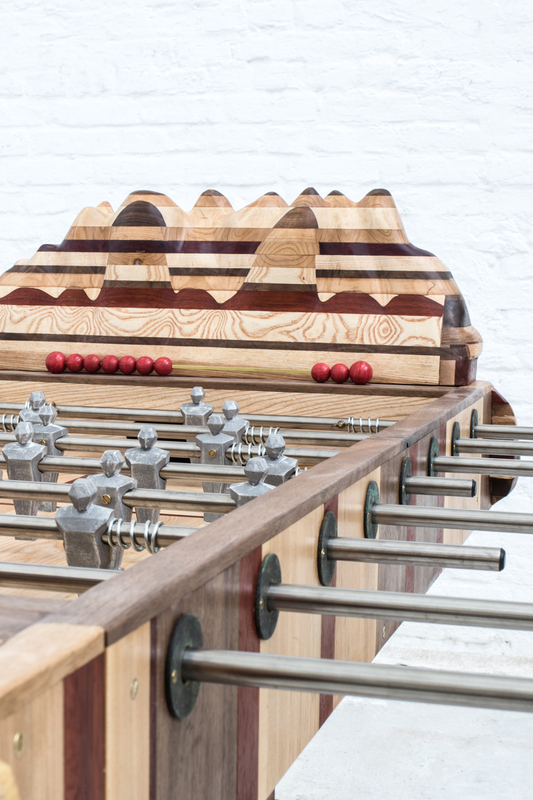 table games [ table football ]. Memories. Childhood. Games. 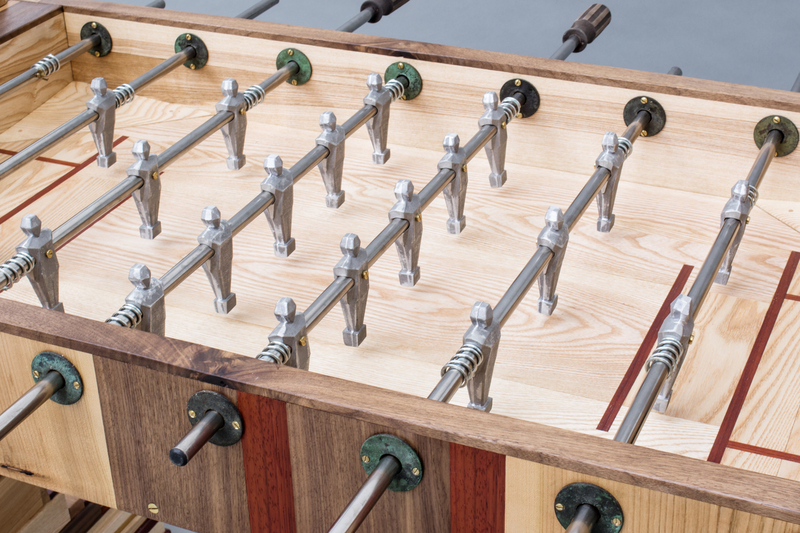 Football, Calcio, Fußball, fútbol! The beautiful game. The international peoples game. Social, tribal. Colours, flags, history, passion. A sport made up of teams and often inspiring individuals. A togetherness. Its Art. Hillsideout not only know it they craft it. 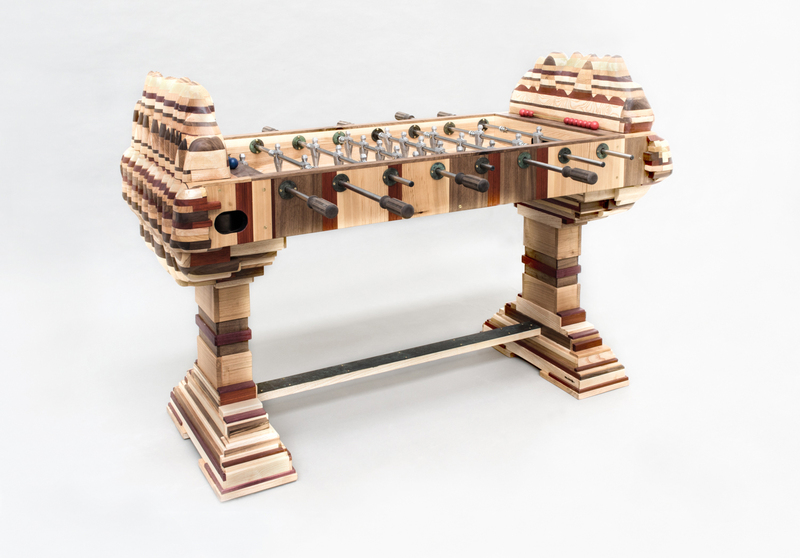 After a successful technical collaboration on billiard tables Nat Wilms and Andrea Zambelli from the art design studio Hillsideout cradled that process to design and build a football table alone. 'Futbolin'. 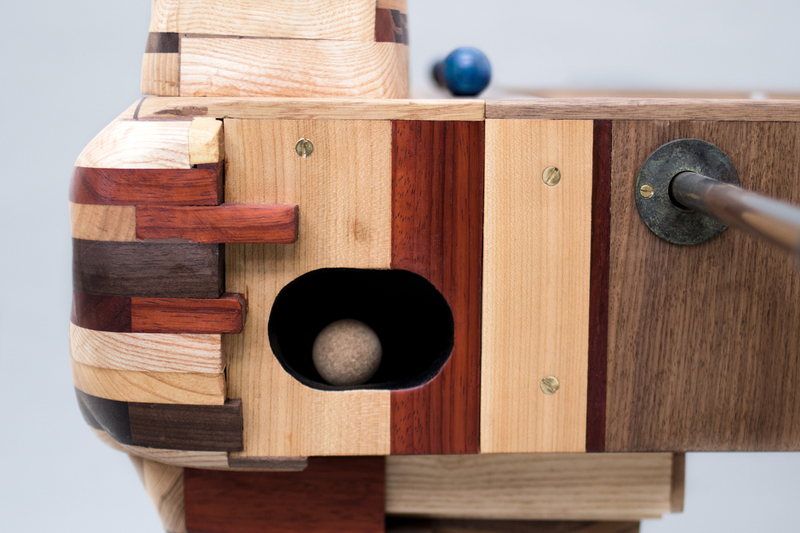 The artisanship involved in the piece is as true as the game itself and while 'Futbolin' could have been a physical build from the initial beginnings by Hillsideout without collaboration, the journey was motivated when paths crossed with artist Michele Balestra. 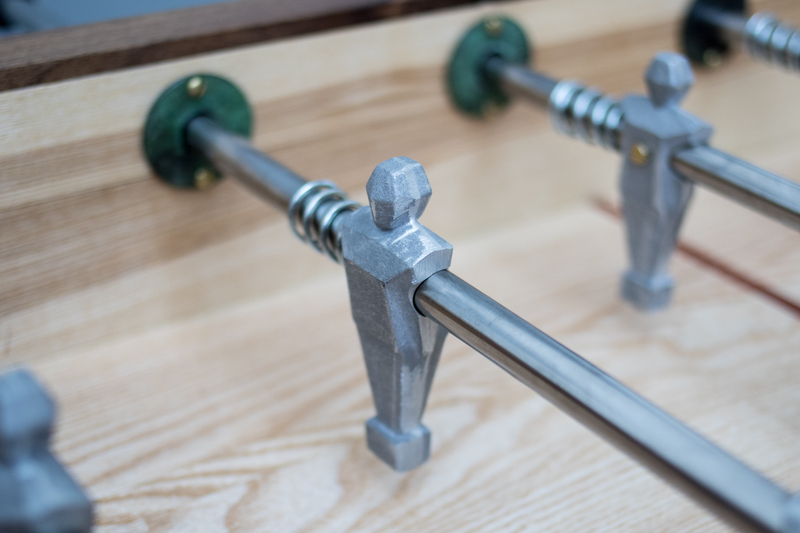 Like the magic of these moments are told, Michele had table football in his conscience and when he showed Andrea what he had by chance in his pocket it was not a coin or keys. It was a football player made of aluminum. The connection was more than a coincidence and that a collaboration should happen was inevitable. Once the ideas had fermented mental inspiration was needed. Enter memories back onto the stage. 'We remembered a beautiful image we saw once high up in the Himalaya mountains. There was nothing around but a football ground where few teenagers played. We watched them from our upper located base camp and they looked so small and tiny in the middle of those high mountains that it reminded us a table football'. Thousands of years of natural history sharing itself with minimal years of youth. Complete? No. Hillsideout wanted to find out more about the history of this game. As if by another turn of fate they searched out a story which almost mirrored what they didn't know. Is that important? No. Is it real? Yes! What is clear is that you can explain anything anyway you wish, but sometimes the journey itself holds many of the answers. Is it really possible that Pele and Picasso could share this space? Only a brave soul would not want that. 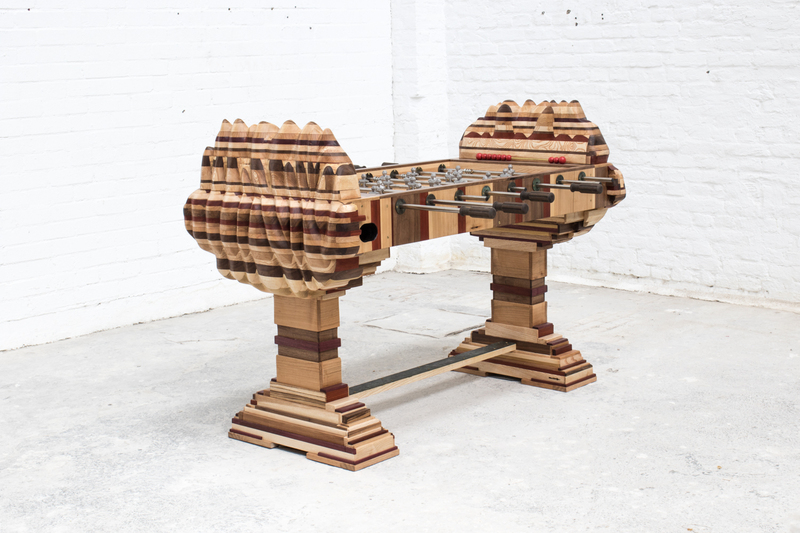 Alexandre de Fisterra - known as the inventor of the futbolín - was 17 years old (probably the same age as the boys playing in the mountains). As he was severely wounded in one of the bombings of Madrid during the Spanish Civil War, he was transferred to Montserrat, to the hermit monks in the ancient monastery situated in the Pyrenees. Back then the Abbey of Montserrat was seen as a sanctuary of scholars, artists, politicians and students. Franco's men were often waiting for wanted people a few miles down the road. In Montserrat he met numerous mutilated children, especially in the lower limbs, none of them, Alejandro Finisterre thought, 'could they play football anymore'?. 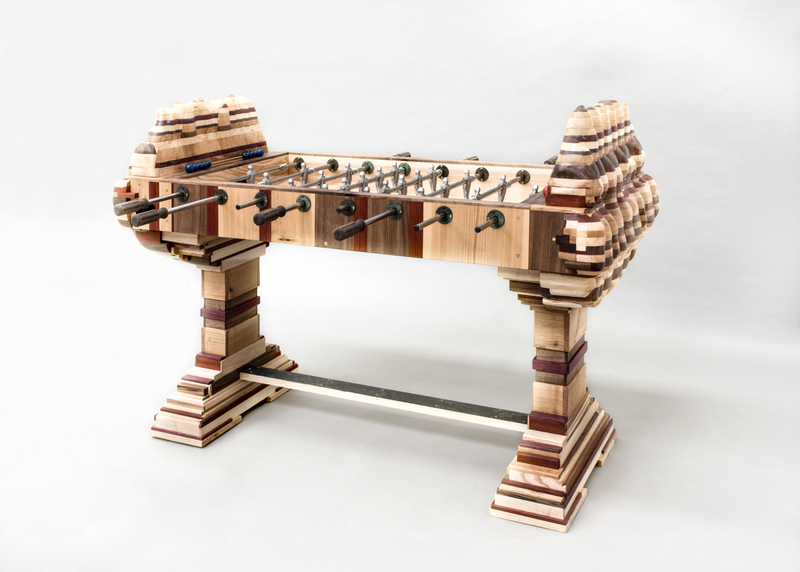 At that point he had a brilliant intuition: starting from the table tennis, he invented the futbolín, the modern table football. The invention was registered and patented in January 1937 in Barcelona but Finisterre lost the documents attesting to the patent in a rainy storm while passing through the French Pyrenees. The game which Alexandre Campos Ramírez had invented though does not bear his name, perhaps because he had had so many names to escape the fascists. He was not only a Galician, a writer, an inventor and a publisher but above all a legendary figure living an adventurous life abroad who by the end had managed to return in his liberated country. 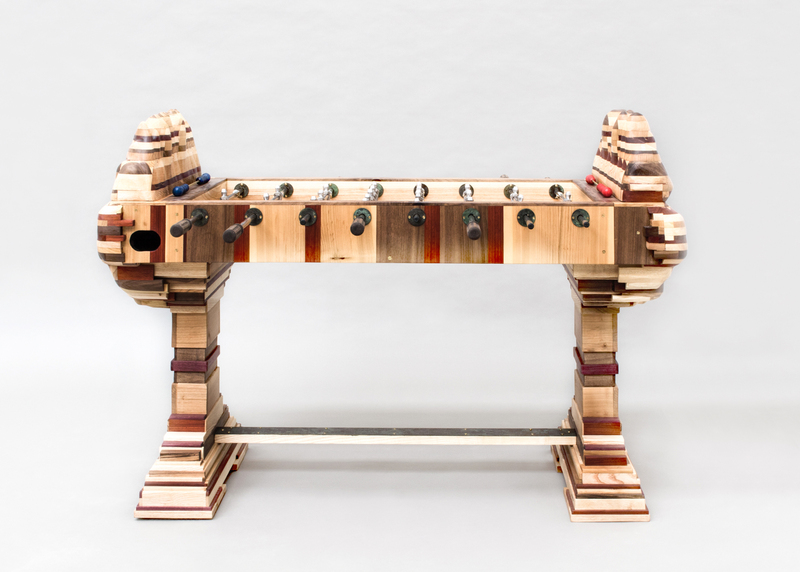 To celebrate the hundreth birth anniversary of the inventor of table football Hillsideout has created a majestic and functionable art piece made of different colourful woods and several metals. 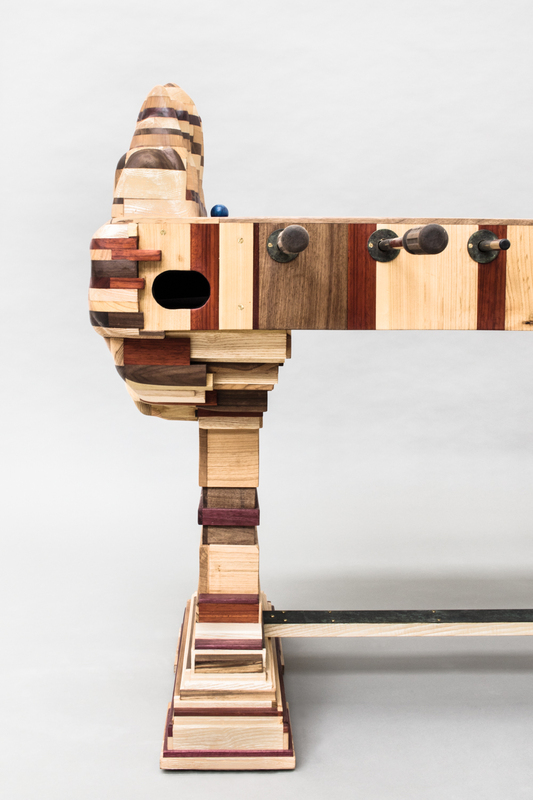 The table legs were inspired by rustic table legs used by monks in medieval age and the hand-carved shape towards the top reminds the shape of the mountains near Barcelona where the first prototype was made in 1936. This unique edition looks like a sculpture but works perfectly like a game. Mostly art is only active from a visual and mental hands off scenario. Problem? No. But this is active. Alexandre Campos Ramírez witnessed crimes beyond what most of us would not wish to imagine. Would it be a crime not to interact with "Futbolin"?